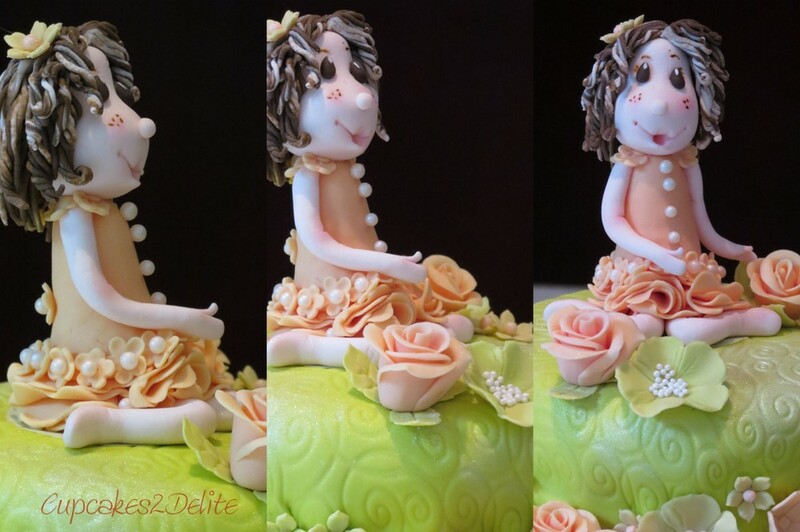 The Story of Jan’s Garden Fairy Cake! 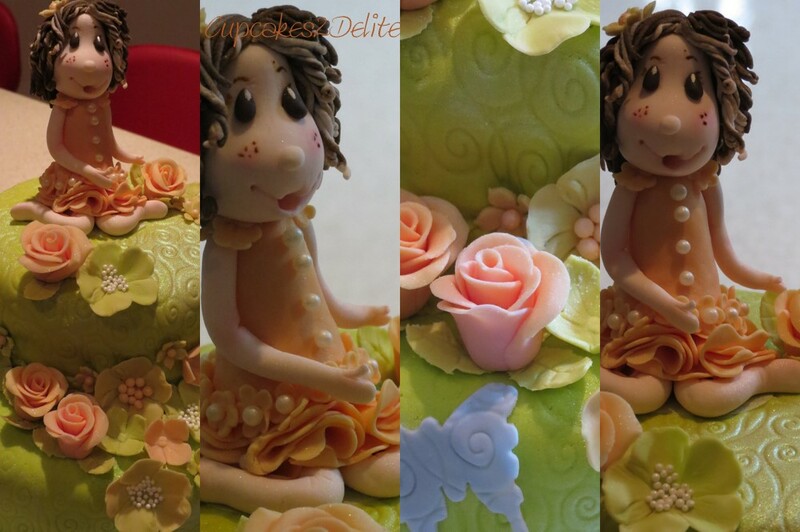 Every famous fairy story has a great beginning and there would be no exception in the story of Jan’s Garden Fairy Cake. One fine Wednesday a couple of years ago in the tranquil setting of Weltevreden Farm I met Jan when I attended my first scrapbooking class at The Memory Shed. Jan was one of Lisa’s first students when she opened her beautiful shop and has stayed a loyal student every Wednesday morning. We have celebrated a few of Jan’s birthdays and as I learn more sugar art tricks the cakes to celebrate these days have slowly improved. And so her story starts…. 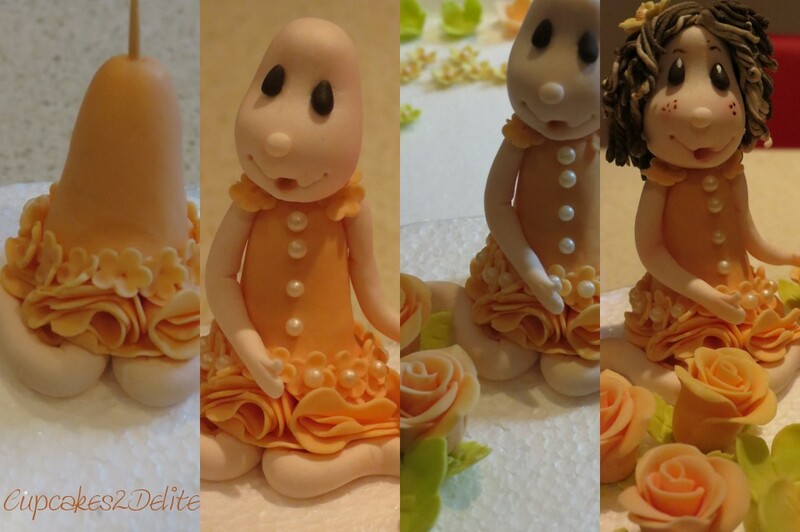 Once upon a time from a humble ball of peachy sugar paste a dainty fairy started her little life. 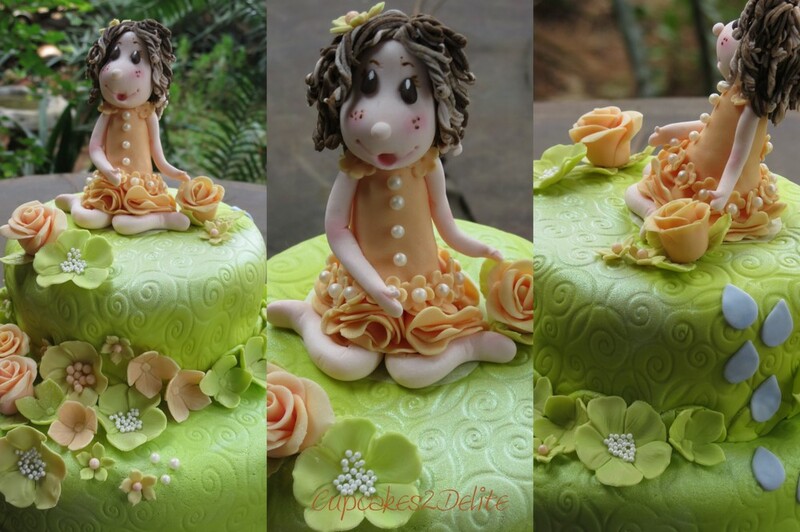 Her legs were shaped from 2 tiny balls of flesh sugar paste and gently folded underneath her gathered peachy skirt. Tiny peach blossoms were then added to the top of her skirt. Every fairy needs a naughty face so this too was added above a collar of peach blossoms. Sugar pearls made the perfect buttons down her tiny dress and her fairy head was adorned with auburn curls to match Jan’s gorgeous locks. Cheeky blush & smile, naughty freckles, a glint of white colour in her eyes and roses and hydrangeas to accompany her to her fairy garden meant that she was ready for the next chapter of her life. 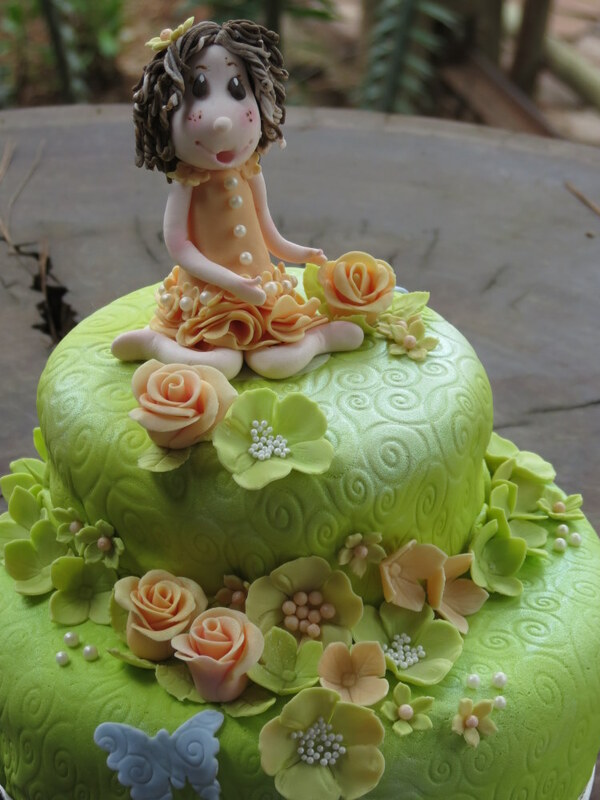 Chapter 1… Once upon a time…..
Jan’s garden fairy could now sit quietly on her green embossed cake and all her pretty roses, flowers and leaves could be added to compliment her beauty in the garden. As her garden grew a few pastel blue butterflies decided they should join the party too and they fluttered onto the cake whispering secrets next to the fairy in her garden. As she sat quietly I couldn’t resist a few pictures of her and of course she obliged by sitting and smiling serenely for me. Even as I moved her around to try out different backdrops for all the photographs she was quite well behaved and was the perfect sugar paste model for the camera. Chapter 3 … a different backdrop. 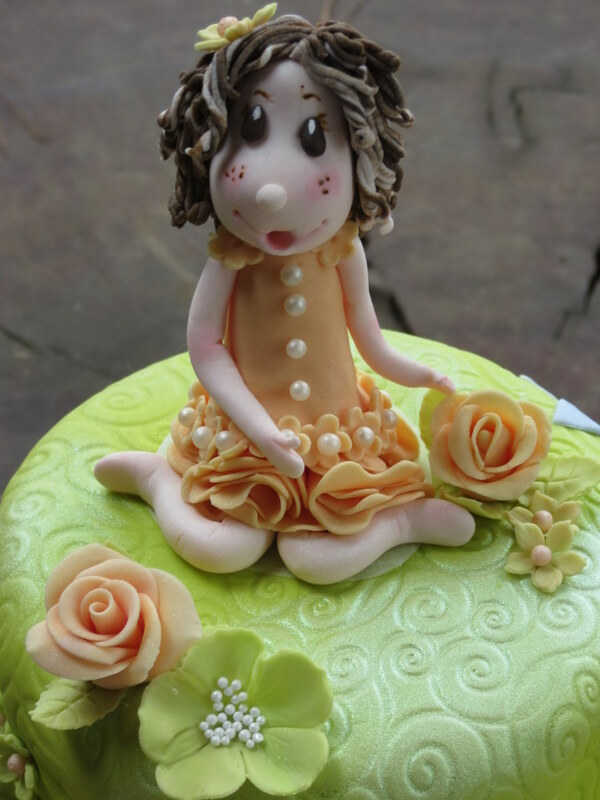 The garden fairy on her cake behaved beautifully on the way to the Memory Shed in my car just delighted to be going to share a special celebration with her Jan. She arrived and the twinkle in her eye brightened as she saw Jan and was met with delighted oohs and aahs from Jan and all her friends. She showed off in pure style and portrayed everything joyful and cheeky that Jan brings to each Wednesday morning as well as a few tears for all the sadder moments she has bravely shared with us. Of course she was then photographed again outside in the pretty garden and then again inside as Jan blew out her birthday candles and opened her gorgeous gifts. After a busy morning the little garden fairy kept her composure as she was finally transported home to be admired once again by Jan’s family and to spend a quiet night reflecting on what how much fun she had had. If she could have told a few secrets here she would have had a few that Wednesday but she just smiled and giggled inside as she left us thinking … what a crazy and fun group of friends and family Jan has around her, so glad for her! Chapter 6 … What a wonderful birthday celebration for Jan! ← Kitchen Tea Cupcakes for Amy! Thank you Tracy, I couldn’t resist a bit of a shimmer on this lovely green for the fairy’s garden. Gorgeous story and cake! Lovely colours. Thank you Petra, I had loads of fun with these colours for Jan. 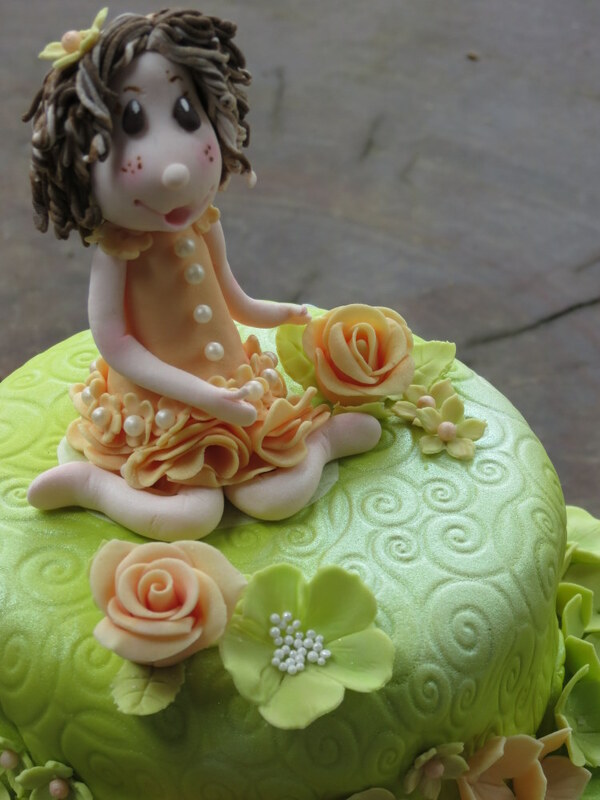 Thank you Wendy, couldn’t resist a little story to go with such a cute fairy and cake for Jan!